Posted on January 13, 2015 by Niles Fence & Security Products, LLC. 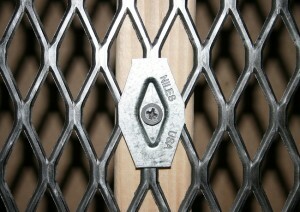 Faster, stronger and easier to use… Niles Fence and Security has upgraded our security clips for security mesh to a whole new level. 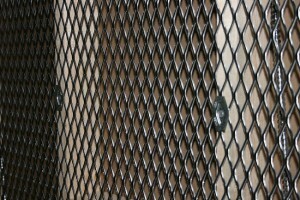 Niles Fence and Security has redesigned their security clips adding strength and efficiency by altering their original design to include a new recessed diamond that “locks” into the diamond pattern of the expanded metal security mesh. The new design will not only allow installers to work faster, but by locking into our classic diamond patterns, you will be able to assure no movement during overlay applications. 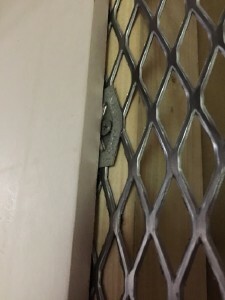 Niles Security Clips are intended to be used to hold our expanded metal security mesh to metal or wood studs inside of a wall. Typically, the mesh wall is then covered with drywall or other materials for final finishing. At the end of the day, the security mesh enforced wall creates a double layer barrier when mesh is added to both the attack and interior wall. Niles Security Mesh and Security Clips will help block attackers from easily cutting through standard interior walls and ceilings.